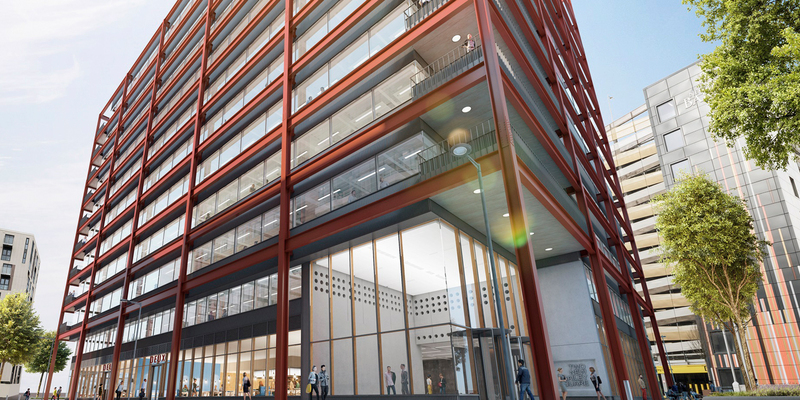 One of Manchester’s longest standing and prestigious global legal practices has agreed a pre-let at New Bailey’s latest office scheme, Two New Bailey Square. Eversheds Sutherland will take approx. 50,000 sq ft across the part 8th, 9th and 10th floors of the ten-storey development on a 15-year lease and will also have its own ground floor reception as part of the letting agreement, giving its employees and clients more freedom, privacy and ease of access. It is relocating its 300+ strong Manchester team from Eversheds House on Great Bridgewater Street where it has operated from for nearly 20 years. New Bailey, which is located just across the bridge from Spinningfields on the banks of the River Irwell, is being delivered by The English Cities Fund, a joint venture between Muse Developments, Legal & General and Homes England. Following the recent completion of the second multi-storey car park, New Bailey is at a monumental phase in its development with five projects currently under construction including office scheme Riverside House, Two New Bailey Square and the third phase of residential development at The Slate Yard. Salford City Mayor, Paul Dennett, said: “It’s fantastic news that Eversheds Sutherland has decided to choose New Bailey as its new home in the City of Salford, further demonstrating that Salford is fast becoming a destination of choice for many businesses operating in the business, financial and professional services sector and a city where firms want to do business, create opportunities and access talent. Cushman & Wakefield acted for New Bailey and OBI Property acted on behalf of Eversheds Sutherland. Cushman & Wakefield and JLL are joint agents at New Bailey.